Scripture cake recipes all share similarities, yet each tends to be a little different. If you enjoy baking cakes from scratch and solving puzzles, you'll enjoy making them. Back when these recipes were invented, women's church groups prided themselves on being able to make the cake without referring to their Bibles. These are delicious fruitcakes in their own right. Truly a novelty. Enjoy a novelty cake baking game from the Victorian Era. 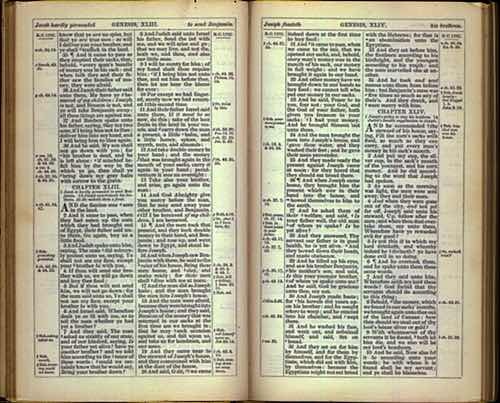 Get out your Bible and try to solve these old fashioned Scripture Cake recipes. Look up the Old Testament references, but try not to look at the list of ingredients. Instead, try to discern the ingredients needed from reading the verses. See how well you can solve the baking puzzle and bake a delicious cake that will delight your family and friends. 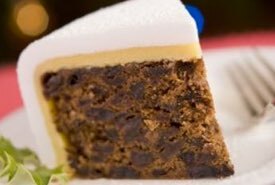 Don't be fooled, these old fashioned novelty cakes are genuine fruitcakes and taste quite delicious. Mom made this fruitcake for us once and if I remember correctly, it tasted really good, but then, I love fruitcake of any kind. Follow Solomon's prescription for making a good boy (Proverbs III, 12), and you will have a good cake. Bake in slow oven. You will need to study the Bible passages to solve this puzzle as there are no ingredients or quantities listed. I've added the biblical references below for you. Follow Solomon's advice for making good boys (Proverbs XXIII, 13), and you will have a good cake. Blend all ingredients and beat well by hand. Pour into a buttered and lightly floured baking pan. Bake at a medium temperature for about three hours and allow to stand for 24 hours for the maximum flavor. Try to identify the ingredients needed in the Scripture Cake recipe above. There are no quantities given as this was simply meant as a memory game to test one's Bible knowledge and cake baking skills. And their father Israel said unto them, If it must be so now, do this; take of the best fruits in the land in your vessels, and carry down the man a present, a little balm, and a little honey, spices, and myrrh, nuts, and almonds. Heat oven to 325°F and have a greased 10-inch tube pan with a solid bottom at the ready. Cream butter. Add sugar and blend well. Add eggs, one at a time, and beat well after each. Beat in honey. Combine whole wheat flour, salt, baking powder, and desired spices in a bowl. Mix raisins, figs, and almonds in another bowl. Add some of the flour mixture to the fruit and nuts and mix with hands until fruit is coated with flour. Add fruit mixture to butter-egg mixture and beat well. Add remaining flour mixture and water alternately, beating well with a wooden spoon after each addition. Spoon batter into prepared pan and bake about 2 hours or until a toothpick stuck in the center comes out clean. Turn out of pan onto rack to cool. If top of cake begins to brown too much while baking, cover it loosely with aluminum foil. 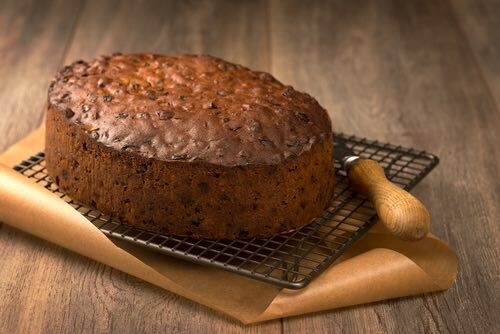 The fruit laden cake might fall a little just before it's fully baked, but its good taste and texture are unaffected. 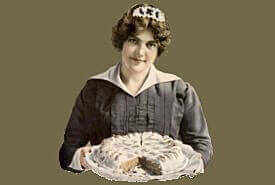 An old fashioned dessert sauce to turn your Scripture Cake recipe into a delicious cake pudding. In a 2-quart saucepan over low heat, melt sugar, stirring occasionally to prevent sticking. After sugar melts, continue cooking, stirring continuously, until it is a deep golden brown. Add water and cook, stirring frequently, until smooth. Remove from the heat, add butter, and stir till it melts; allow to cool. Drizzle over cooled Scripture cake and garnish with whole almonds. Most Scripture Cake recipes first appeared in the early nineteenth century, but some might have originated at an even earlier time. This type of novelty cake recipe was very much in fashion at women's sewing bees and home Bible study groups in the 1830s to 1860s, and to a lesser extent up until the 1930s. They were presented as a fun cake baking game which tested the participants' knowledge of the Bible and their cooking abilities, and to prevent the gathering from indulging in idle tittle-tattle, though their success in preventing the latter is up for debate. Once the cake had been baked, the children who were present passed cake slices to the guests.